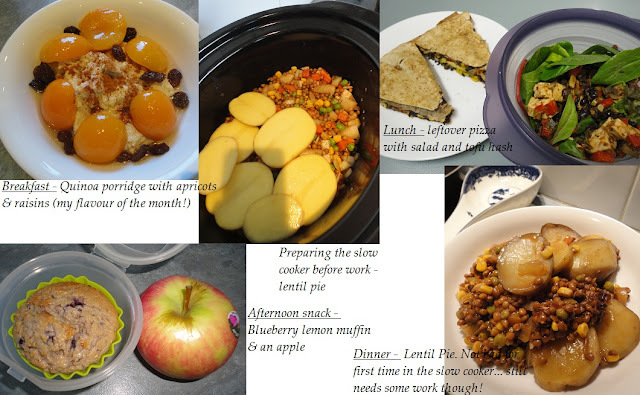 Add your link to What-I-Ate-Wednesday on the Peas & Crayons blog. Mexican Pizza - slices sandwiched together. Lentil Pie - just made in the slow cooker instead and sliced potatoes in place of mash. When I think of a meal called "hash", potatoes come to mind! But who said you can't make a hash with tofu instead?!?!? You can always substitute the tofu for potatoes if you want a traditional hash! Chop the tofu, capsicum and onion into little cubes. Add to a dry preheated frying pan. Add the herbs. Stir and add spoonfuls of water as needed to stop the mixture from sticking to the fry pan. Cook for approx 10 minutes or until veggies are soft. Stir in the salsa. hehe mmmmm both sounds good too!!! When ever I hear hash I always think of potatoes or butternut squash cubes. Love the idea of interchanging them with tofu! hehe that's exactly what I 'used' to think of with the word 'hash' too!!! Ooh, delicious Sandy - all of it but this hash sounds great! I definitely would like it more with tofu than potatoes.